As a reminder, with “Supercharge Your Gift Card and Cash Too,” Hasbro is rewarding consumers who spend $20 or more in gift cards (or cash) on select Hasbro toys and games with one of more than twenty FREE Hasbro toys and games valued at $10 or more. The promotion began on 12/25/10 and runs through 1/31/11. No matter what your kids are into, they’re sure to love receiving a little something extra from one of your favorite Hasbro brands, including TRANSFORMERS, G.I. JOE, MARVEL and STAR WARS! Check out the details at Hasbro.com. TF: Prime Q&A Coming Up, What Should We Ask? As we at TFV participate in Hasbro’s Transformers Q&A program, we’ve been invited to ask this Friday, January 21st, 1 question of the TF: Prime production teams. This is an exciting opportunity, but only 1 question about the newest Transformers show means we need to figure out what’s the best question to ask. And fast! So please participate in the TF:Prime Q&A thread we’ve got going on, and check back for the answer on February 7th. 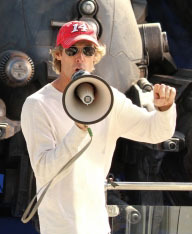 The L.A. Times has an interview with Transformers 3 director Micheal Bay, in which he discusses the upcoming Transformers film, as well as his thoughts on Revenge of the Fallen. Read the remainder of his thoughts here. Happy New Year! For the past 3 weeks, we’ve been reviewing 2010 in Transformers, and it’s still an ongoing discussion. So come on in and share your opinions with us. Who are your favorite figures from this year and why? Click here to check out TFV’s 2010 Year in Review.